We’d love your help. Let us know what’s wrong with this preview of Antarctica by Susan Fox Rogers. To ask other readers questions about Antarctica, please sign up. Reading this years after reading William L Fox's impressive Terra Antarctica: Looking into the Emptiest Continent and Alexa Thomson's Antarctica on a Plate was an amusing experience... Same people and places (and in some cases events) from different author's points of view. The raambling confessions that one author within this anthology forced on Fox while on a hike were particularly hilarious. I felt huge amounts of empathy for them both. I guess in a place as sparsely populated or visited, tha Reading this years after reading William L Fox's impressive Terra Antarctica: Looking into the Emptiest Continent and Alexa Thomson's Antarctica on a Plate was an amusing experience... Same people and places (and in some cases events) from different author's points of view. The raambling confessions that one author within this anthology forced on Fox while on a hike were particularly hilarious. I felt huge amounts of empathy for them both. I guess in a place as sparsely populated or visited, that's hardly a surprise. It was good to be reading a new book on the place during my own country's centenary year of Antarctic exploration. Life On the Ice was totally US centric, but that's not surprising, or even a criticim - more a reminder that I need to seek out more from an Australian perspective if I can. I imagine that life in Davis or Casey is probably not that different, if somewhat less crowded and with the vast majority of people employed by the government, rather than hodge podge of employers including contracted private companies like Raytheon. I loved the little insights into life, rather than science or operations, that this anthology offered. Any polar base must be an absolute goldmine for psychologists and sociologists. References and concepts I've come across in other sources cropped up here again: the idea of 'the ice' and 'the real world'; relationships (professional, friendly, and romantic) starting, breaking, reforming, imploding, ending, or being put on hold during a six month sojourn in the 'real world; and the importance of food. In fact, the piece by the chef remains one of my favourites in this collection, and references the thoughts of over a century of explorers and their cooks on the subject. I've found myself very interested in Antarctica in the last few years. I read Endurance twice (unbelievable book) and have watched several documentaries on the mysterious continent. 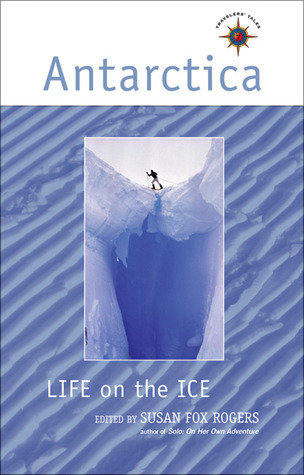 Following this interest, Antarctica: Life on the Ice was given to me by a friend whose cousin, Susan Fox Rogers, was the editor. The book is a collection of essays from men & women that have lived on Antarctica, some for a season, some for years. They cover everything from ice depression to practical jokes and, to I've found myself very interested in Antarctica in the last few years. I read Endurance twice (unbelievable book) and have watched several documentaries on the mysterious continent. Following this interest, Antarctica: Life on the Ice was given to me by a friend whose cousin, Susan Fox Rogers, was the editor. The book is a collection of essays from men & women that have lived on Antarctica, some for a season, some for years. They cover everything from ice depression to practical jokes and, together, paint a vivid picture of what it's like to be down at McMurdo Station. Like most collections, the quality of the works vary fairly significantly. A couple were poorly written or boring, but by and large the set was really fascinating. * The Day it Rained Chickens. I laughed seriously hard during this story. Amazing. * Lost in the Storm. Intense. This is a fantastic collection of essays about "life on the Ice". As with any collection by multiple authors, the mix can be hit-or-miss, but this one is pretty much all hits. There were only one or two that I didn't like as well, but they were still interesting even if they didn't captivate me quite as much as the others. Overall, though, this is a truly fascinating look at a truly fascinating land. I especially appreciated the diversity of perspectives included herein, with artists/writers and This is a fantastic collection of essays about "life on the Ice". As with any collection by multiple authors, the mix can be hit-or-miss, but this one is pretty much all hits. There were only one or two that I didn't like as well, but they were still interesting even if they didn't captivate me quite as much as the others. Overall, though, this is a truly fascinating look at a truly fascinating land. I especially appreciated the diversity of perspectives included herein, with artists/writers and support staff contributing their views of the Ice as well as those of scientists. There's a lot more going on at the bottom of the world than someone only casually acquainted with the continent might think! This was a really good collection of stories and experiences written by people who have lived/worked in Antarctica primarily over the past 3 decades. It was well edited and each piece had a short introduction giving a bit of background on the writer. Definitely worth reading for anyone interested in Antarctica. This was one of my text books for Writing About Places at Oregon State Univ. Fantastic collection of essays on an other worldly place. I've been obsessed with Antarctica for as long as I can remember, and enjoyed the glimpse into everyday life at McMurdo, but especially enjoyed Ainleys essay on the Adelie penguins. I am the author of MY REACH: A HUDSON RIVER MEMOIR, to be published by Cornell University Press in September 2011. In this memoir, I explore the Hudson River from my kayak. As I encounter snapping turtles and great blue heron, visit crumbling ice houses and cement factories, you will learn about the rich natural and built history of this river. In the process I also tell my own story of family and I am the author of MY REACH: A HUDSON RIVER MEMOIR, to be published by Cornell University Press in September 2011. In this memoir, I explore the Hudson River from my kayak. As I encounter snapping turtles and great blue heron, visit crumbling ice houses and cement factories, you will learn about the rich natural and built history of this river. In the process I also tell my own story of family and loss.